After leaving Amsterdam, we spent a couple of nights in the well-preserved medieval city of Brugge, Belgium. It's undeniably an amazing place, but because its sole purpose today is as a tourist center, our family was divided on how fun it was to be there. Me, I'm not afraid to be a tourist when that's what I am, and I give Brugge (pronounced Brew-[throat-clearing-noise]-Huh in Flemish) a thumbs up. It's easier to say the French version of the city name, Bruges, with a soft "g" like the second one in "garage", but it is in Flanders and most of the people in the area seemed to speak Flemish first. 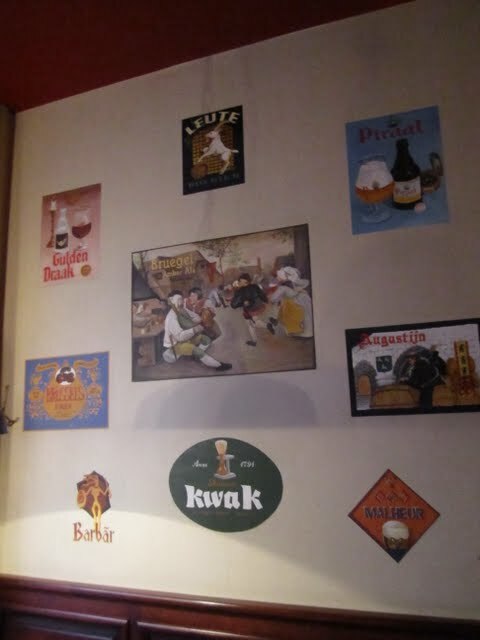 The post after this one will be a compendium of a few interesting Brugge beer spots -- including the story of accidentally wandering right into De Bier Tempel in our hour of greatest need -- but today I want to single out an outstanding gastropub in Brugge: the Bierbrasserie Cambrinus. We were advised to call ahead for dinner reservations, but we wouldn't be pinned down like that, and the four of us stumbled into Cambrinus about 7:30 PM on the Monday night that we arrived in town. At the door, we were greeted somewhat coolly by a pretty hostess who was exasperated by our foolish lack of reservations, but she told us we could sit at the bar -- even our two teenagers -- and see if anything came up. Luckily there were four seats at the bar, and the place had such a lively atmosphere that we didn't mind hanging out for a beverage, even though the bartender had no time for conversation and it sounded like there was no way we would get a table. We expected to have a beer there and then move on to someplace less crowded, but a nice table was found for us before Carla and I had even finished our beers. They never asked our name for the waiting list, so I can only assume the entries were something like "unkempt American with wife and two daughters" or "drunk Australian couple". Whatever the system, we were quite grateful to be seated, and our waiter patiently helped us figure out the next beer as we waited on our food. Oh my goodness, the food. It was a little pricey, but it was one of the most memorable meals of our vacation. 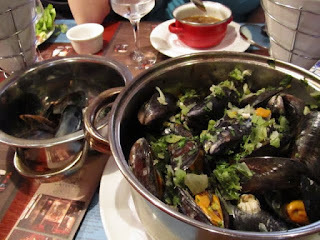 The picture at the top barely does justice to the giant steaming pot of delicious mussels that was served me, and I'm sad that I cut the accompanying fries out of the picture. Nor did I get a photo of Carla's Flemish beef stew with a side of homemade applesauce, but it was also fabulous. Even the vegetarian in our party was content with her French onion soup. If you want to drool over the menu, it's posted here in English, though for some reason it omits the various mussel options. I believe there were 8 beer taps, but the choices weren't that stunning. The real beer action was in the large wood-bound tome that listed the hundreds of bottles available. 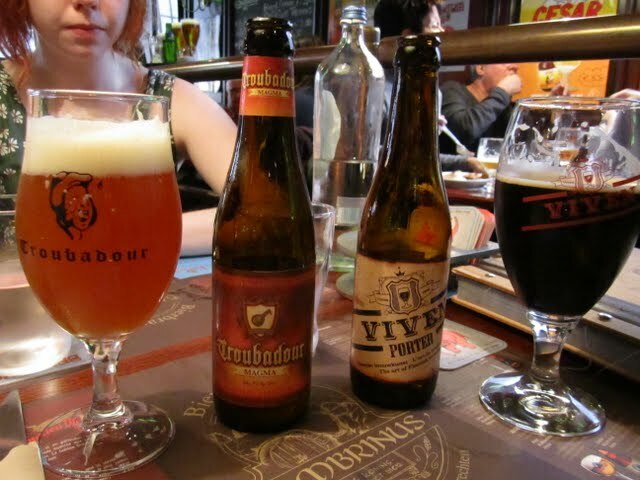 We enjoyed Cambrinus so much that -- after taking a look at a couple of other restaurants -- we ended up there for dinner the next night also. Same modus operandi: walk in at 7:30 to a frosty reception; "you don't have reservations? "; wait at the bar; here's your table. They aren't kidding about being busy -- every table was always full -- but somehow our timing was right both nights to get us a table in a comfortable amount of time. Another stunning meal was had, accompanied by some mighty fine beer. 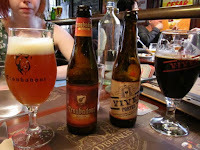 I especially liked the Viven Porter that Carla ordered, and the Straffe Hendrik quadrupel from local brewery De Halve Maan. I can't recommend Cambrinus enough. Excellent beer, food, and atmosphere. The service is a little bit brusque, but that seems to be the nature of a tourist town, and the servers were actually quite professional under their hard shell.